Hello, I'm Gregor and I put this site together. 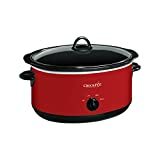 At first, you'll find an overview of recommended crockpots, followed by a public poll and a general buying guide on crockpot. 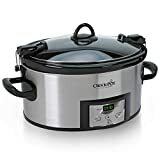 Further down on this page, we do link to other well-written articles and reviews about crockpots. At last, you'll be able to weight in your own opinion in the comments section. If you also want to vote on the best crockpot, click here to view the poll. It’s no surprise that restaurants like to pepper their menus with words like “slow-simmered.” Long, thoughtful braises are synonymous with full flavors that make food come alive. Home cooks have embraced that idea, but not the time it takes to tend a stovetop pot all day while the world passes them by. For that, they have the humble Crock Pot. 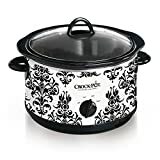 All Crock Pots are slow cookers, but not all slow cookers are necessarily Crock Pots. 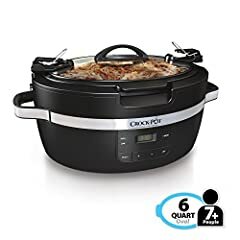 Crock Pot is a brand name that was established after the original “Simmer Crock,” an Irving Naxon inspiration, was reinvented by Rival and marketed to a new generation of working women in the 1970’s. 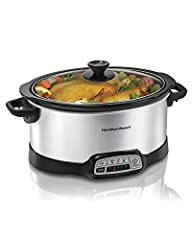 The brand is now owned by Sunbeam and similar slow cookers are made by a variety of companies including Hamilton Beach,Cuisinart and West Bend. 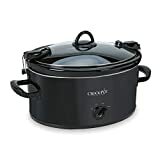 Slow cookers consist of a glazed ceramic or porcelain crock that sits in a metal housing equipped with a heating element. During use, the element heats, transferring warmth indirectly from the outer shell to the stoneware container. 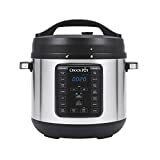 This produces an average cooking temperature between 160 and 300 degrees, slowly simmering the contents over several hours. As the food cooks, it releases steam which is trapped by the lid, creating a light vacuum seal between the lid and the rim of the crock. This keeps valuable moisture in the food, instead allowing it to escape as steam. Both appliances achieve similar results, but pressure cookers use a combination of high heat and pressure to cook foods quickly. They prepare meat in a fraction of the time of a slow cooker, but the lid can’t be opened while cooking and it should never be left unattended. Crock Pots use low wattage, producing lower temperatures and no pressure. The base never gets hot enough to scorch the counter and it's safe to leave the house while it's running. For whole-meal recipes that require the addition of quick-cooking ingredients in the latter stages of cooking, a slower cookers lid can be safely removed. A slow cooker helps you prepare savory, nutritious meals with less hands-on time in the kitchen. Just assemble your dish in the morning and by the end of the day, dinner is table-ready with a fraction of the effort and power used compared to using a traditional cooktop — and clean-up is a breeze. Crock Pots can make inexpensive meats taste like costly filets. The condensation produced by the long, sealed cooking process continually bastes meat, making it both tender and juicy. Other foods gain a flavor boost from the slow, penetrating heat. All slow cookers work on the same principle, but they’re available in a wide range of shapes and sizes with distinctive features that may make one a better choice. These are the most important to consider. Slow cookers come as small as a single quart to a crowd-pleasing 18-quart behemoth. The capacity is important because if the pot isn’t full enough, delicate food can scorch, but if it’s overcrowded, less self-basting condensation is created. Ideally, the pot should be 2/3 full at minimum and ¾ full at maximum. This means that the size of the pot isn’t the same amount of food it will make. Small pots are limited to things like keeping a single lunch or party dip warm. Sizes from 1½ to 4 quarts are good for couples and small families, but if you entertain, like to make large batches of food for the freezer, or regularly have a big crew to feed, a 5-quart to 8-quart pot is more realistic. Sizes greater than that are typically reserved for large items like whole roasts, chickens and small turkeys. Once exclusively round, oval and rectangular slow cookers have expanded on the idea of multifunction cookware by overthrowing roasters as the king of cooking meat. 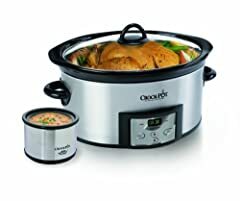 Once the only contained cooker that could hold a whole bird, many roasters have seen their last days in favor of Crock Pots that are now similarly capable, but with the same benefits that make slow cooking appealing. For soups, stews, beans and other foods with a high liquid content, a tall, round shape is better for ladling. To make past dishes like lasagna or meats and other foods whose flavor benefits from the formation of a light crust on top, an oval or rectangular model allows you to spread it out more, helping a golden brown color develop. When using a slow cooker, the trick is to avoid opening the lid unless it’s absolutely necessary since that lets out heat and extends cooking time. See-through glass or lightweight plastic lids let you see what’s going on in the pot without peeking. The issue with plastic lids, however, is that in time, repeated exposure to heat and cleaning cloud the material, making it dingy and hard to see through. In addition, plastic lids are so light that occasionally, enough steam forms to lift the lid off the rim of the crock, breaking the seal. Crocks are made of stoneware – typically glazed ceramic. On the smallest models, they’re integrated and can’t be removed for cleaning, but on larger sizes, removable crocks are now standard. Most are both dishwasher and microwave safe, but only a select few can go under a broiler for finishing. The glaze makes the interior of the pot fairly easy to clean and partially stain resistant, but some foods and even time will stain light colored crocks. For the best appearance over time, black is bulletproof. Expect white and light colors to be more susceptible to discoloration. Basic crockpots come with a simple switch that must be manually set to the desired temperature. Typical choices are low and high and no models have exactly the same temperature range. An average low range is between 160-190 degrees Fahrenheit and high between 220 and 300 degrees. Programmable models may have the same options, but a few allow you to select a broader range of temperatures. The biggest benefit to programmable models is a timer. Timers in most current models can’t be set for a specific turn on time. Since it’s unlikely you would allow food to sit at room temperature for extended periods before turning it on, chances are that’s not a big deal, but a model with a thermometer that senses when the food as cooked and turns itself down to warm can be the difference between juicy and dry meat. If you like to take your food on the road, models with travel-friendly features are a plus. Favorites are locking clips or straps that keep the cover in place and insulated bags for carrying the pot as well as a few serving utensils. For a buffet-style feast, consider connectable units. They don’t always cook, but can keep several different types of food warm without need for Sterno or a steam table. Mix and match sizes and get the party started! For a large family, a 6-quart slow cooker is ideal. Whether manual or programmable is a matter of preference, but the programmable styles are not complicated and add a dimension of flexibility you may not know you need yet. Round or oval is the most versatile shape, but if you roast more than you ladle, a rectangular shape gets amazing results and travel-friendly features are always handy. A Crock Pot between 3 and 5 quarts is the most versatile for couples and smaller families. Anything less than that is limited and likely won’t give you the performance you need. When in doubt, go larger. 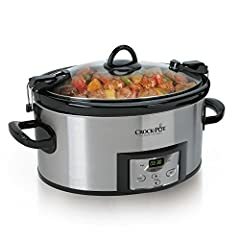 Perhaps the best part about Crock Pots is that they're trusted technology and the recipes to make in them are nearly endless. If you don’t have a slow cooker, try one and if you’re not quite sure which size to buy, they’re budget-friendly enough to buy two. Happy cooking! New: Our editorial list of additional articles. 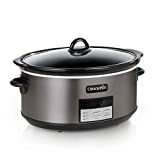 We decided to gather informartion all around the internet and present you a list of helpful, external links to interesting reads about the best crockpots and their reviews and guides. You're not convinced by the previous writings about crockpots? Of course you can just choose by visual impression, that's why we present you all our chosen products at a single glance. A click on any image is enough to open an external link to the best offer we could find. 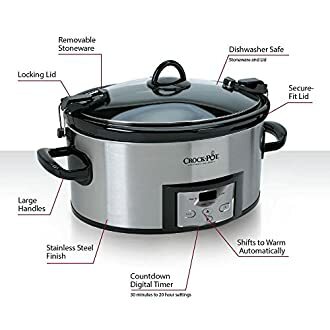 Finally, we want to present you our rating criteria for our crockpot comparison, so you can better understand and comprehend our recommendations and the rating process itself. 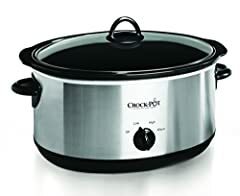 Furthermore, we still ask you to keep your eyes open for short term deals in order to make some great bargains with crockpot in 2019. Published by G. Krambs on StrawPoll.com (last update on 2019-04-18 08:36:22). 14 of 23 readers found this article helpful.